The HMC5883L is a triple-axis magnetometer compass, which uses I2C for communication. 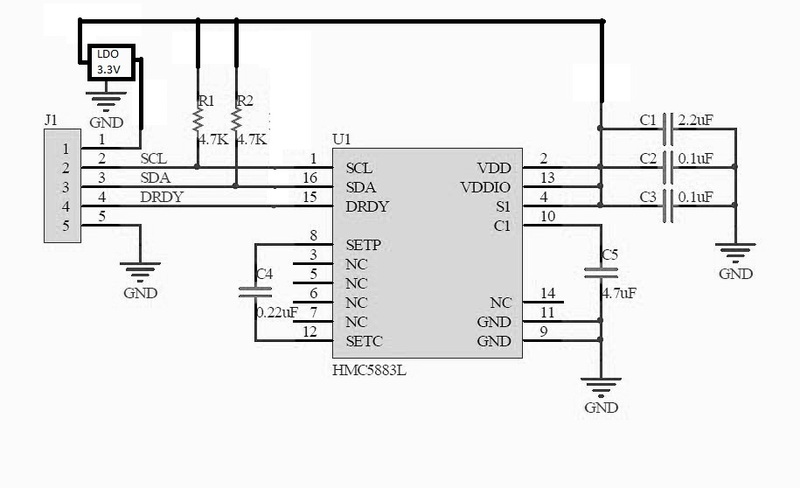 Compass heading accuracy of 1° to 2°, provided by internal 12-bit ADC (Analog-to-Digital Converter). Includes on-board voltage regulator, allowing you to power the module with voltages between 3.3V and 6V. The module includes on-board pull-up resistors on the I2C lines. There is a data ready pin (pin DRDY) you can use to make your communication with the module more efficient; refer to the datasheet below for details. Since this module has such great compass heading accuracy, it is great for giving your robot precise navigation abilities. This little module gives my robot a good sense of direction. In conjunction with the Ultrasonic sensors that Addicore sells I can navigate a small maze with my robot.